All transactions are safe and secure with a reliable history in online purchasing behind each of our associates. 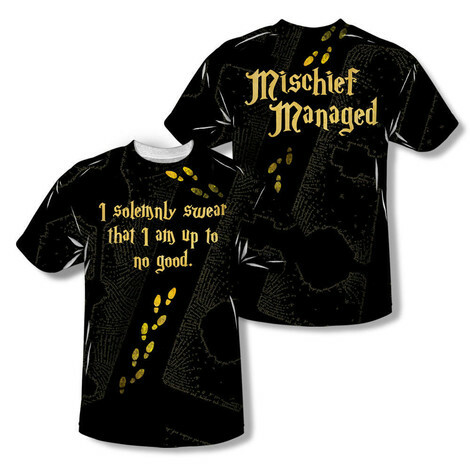 Buy the I Solemnly Swear / Mischief Managed t-shirt to own Harry Potter clothing and merchandise. "I solemnly swear that I am up to no good" are the words used to reveal the secret ink on the Marauder's Map. The ink reveals a map of Hogwarts, including secret passageways and the location of everyone within the grounds. Saying, "Mischief managed!" returns the map to its original blank state. Fred and George Weasley give the map to Harry in his third year. The wizardly words that unlock the map are displayed in white on the front of these Harry Potter tee shirts, while the words to close the map are displayed on the back. In addition to the I Solemnly Swear / Mischief Managed tee above, browse the Harry Potter Clothing Gallery for more apparel like men's and women's clothes, kids shirts or hoodies.